We began to settle into a late-spring sampling of entries of flora and fauna in equal measure. The occasionally severe spring weather dropped a tornado in Schenectady County while a milder natural phenomenon showered the beach in Beacon in a blizzard of white. 5/20 – RamsHorn Swamp, HRM 112.5: On the fourth set of its 500-foot haul seine today, DEC’s Hudson River Fisheries Unit caught, among other species, 29 rudd – the largest number they had ever seen in a single haul. The rudd were about eleven to fourteen inches long. 5/20 – Alpine, NJ, HRM 18: Clear skies and a Baltimore oriole greeted the Tappan Zee and Pearl River High School students as they entered the Alpine Boat Basin park for a day of hiking and seining. Lots of effort went into seining but the river was slow to offer up any fish. We ended the day with one Atlantic tomcod 70 millimeters [mm] long, a white perch (127 mm), a bay anchovy (83 mm), and a grass shrimp. The salinity was a very low 1.7 parts per thousand [ppt]. 5/22 – Duanesburg, Schenectady County, HRM 157: In the midst of a line of violent storms, a tornado cut a swath through this area late this afternoon, destroying buildings and much property but causing no human casualties. 5/22 – Town of Wappinger, HRM 67: Heavy rain (1.75 inches) swept across the river today. High winds abetting a strong ebb tide had whitecaps on three-foot-high rollers. The blackflies went into hiding. 5/22 – Croton Point, HRM 35: A Westchester County rarity, a cattle egret, presented itself today in a field at the base of the point, feeding among a flock of Canada geese. 5/22 – Croton Point, HRM 35-34: Between squally spells I managed a nice morning walk. Bush honeysuckle was in bloom; the scent pervaded the moist air. Out on Haverstraw Bay, lost in the mist, a loon called just once. Glad as I was to be where I was, that call had a predictable effect. Instantly, half of me was transported hundreds of miles north where loon parents were guarding nests on lakes and beaver ponds. 5/23 – RamsHorn-Livingston Sanctuary, HRM 112.5: Among the “regulars” today, there were also a yellow-billed cuckoo and a Canada warbler, still hanging around the observation tower (breeding there?). Best of all was hearing the calls of juvenile Virginia rails! 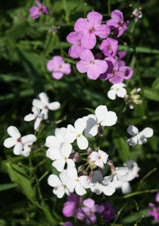 5/23 – Ulster County, HRM 97: How wonderful to return to the Hudson Valley with its amazing diversity of flora and fauna after spending a winter in Florida. We were greeted by the scene of striped bass anglers in great numbers on both sides of the Kingston-Rhinecliff Bridge. Lilacs were in full bloom and our first ruby-throated hummingbird reminded me to put the feeders out. Overhead were long formations of brant heading north. A large tanker threw up such a huge wake at low tide that it thrust many white perch and river herring up on the shoreline with no way for them to get back in the water. My neighbor and I threw back about 30. 5/23 – Pleasant Valley, HRM 76: For the first time in ten years I saw a red fox as it walked across my back yard, sat and scratched, and then just looked at me. I grabbed my binoculars to get a closer look. It was a large fox, very high on leg, and quite magnificent with a long bushy tail. 5/23 – Croton Point, HRM 34.5: There were at least 24 bobolinks on Croton Point’s landfill this morning, including three singing males. Two different grasshopper sparrows were singing, with a third one perched in a different area. 5/23 – Croton Point, HRM 34.5: The male bobolinks were back aloft, the display flight and lovely liquid song touching up my morning as no jumbo mug of coffee could possible do. On the field at the entrance to the point, the cattle egret was doing a herky-jerky breakfast patrol. 5/24 – Norrie Point, HRM 85: Today we had an international class of senior high school students helping us to sample the river. Students from the Manhattan Center for Science and Math joined with those from Maurick College in Vught, The Netherlands. It was wonderful for the educators to see the river through the fresh eyes of those who were experiencing the estuary for the first time. The resident species – sunfish, darters, killifish, white perch – were all there, and one unexpected fish, a fathead minnow. 5/24 – Annsville Creek, HRM 43.5: Imagine our wonder and delight today as we watched an adult bald eagle pluck a fish from Annsville Creek and then fly over our car with his catch. 5/24 – Croton-on-Hudson, HRM 35: I woke up at 3:00 a.m. hoping that the skies had cleared so I could see some of the expected meteor shower (the Camelopardalids). However, the sky was thickly clouded with no chance of meteor sightings. But as I squinted into the gloom, I began to see flickers of light in the air, at tree-top level, on the window screen – no meteors, but fireflies. 5/25 – Ossining, HRM 33: At dusk a loud cackling sound overhead caused me to look up to see hundreds of brant flying north over the river. They were not in a typical “V” formation; their lines looked like swirls painted on the sky, quickly moving out of sight. 5/25 – East River, New York City: We have been seeing American eels of all sizes this week, hooked by anglers and hiding out in our oyster cages. Our oyster cages (gardens) are hanging off a semi-protected bulkhead in the East River about six inches below the projected low tide water mark. These are a part of the New York Harbor School’s Billion Oyster Project. A network of students come by periodically and check the growth of the protected spat-on-shell young oysters to determine what locations in the harbor offer good habitat. The cages also offer protection as the young shellfish grow to a size that will survive on an open reef. 5/26 – Town of Poughkeepsie, HRM 67.5: Walking past my window on a warm Memorial Day evening, I stopped to look at something that had caught my eye – the first “lightning bugs” or fireflies of the season! 5/27 – Minerva, HRM 284: This is the first time in about fifteen years that we have not had an American bittern with their “bad plumbing” calls in the marsh. I did hear an alder flycatcher for the first time (the standard “fee-be-o” call) – in the alders, of course. It was prime time for painted trillium, starflower, and goldthread, with Clintonia just starting to flower. Shadbush flowering was pretty much done; it began around two weeks ago. All things in the woods were intensely green and beautiful. 5/27 – Ravena, HRM 133.5: I glanced out into the backyard this afternoon and spotted a bird flying back-and-forth in my garden – a flycatcher, possibly a kingbird. But the coloration wasn’t quite right. After some further investigation, it appeared that it might be a visiting western kingbird, with a yellow-tinged abdomen and brown wings. 5/27 – Tivoli Bays, HRM 100: I spotted a horned grebe here today. It was also seen yesterday by Susan Fox Rogers while she was kayaking. 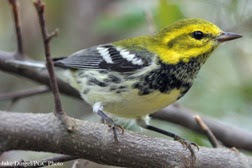 Barbara Butler (Waterman Bird Club) is checking but she thinks this might be the latest spring migration date on record for this species in Dutchess County. 5/27 – Milan, HRM 90: I remove my hummingbird feeder each evening to prevent bears from taking it from my deck as in past years. I went out later than usual tonight and heard the loud repetitive song of a whip-poor-will. I could not tell if it was one or two birds. The clear song brought back memories of days past in rural New England where I often heard it. It would be nice to have a breeding pair nearby. Barbara Butler told me that she did count whip-poor-wills during this year’s Waterman Bird Club Dutchess County May census. 5/27 – Town of Poughkeepsie: I stopped by NY62 today for the first time is quite a while and from the distant vantage found the eagle’s nest so well concealed by new leaves that all I saw was a big wing flapping! The eaglets are growing up. 5/27 – Beacon, HRM 61: There was a “blizzard” on the beach at Long Dock today in a strong and sultry southwest breeze. The wind was dispersing clouds of cottonwood seeds as well as the fragrance of honeysuckle. The midday high tide covered the entire beach, limiting our catch to banded killifish. The river was 68 degrees Fahrenheit. 5/27 – Bedford, HRM 35: Things were starting to get noisy at the great blue heron rookery. There was a constant chatter from the nestlings looking to get fed and they sure were growing. They now appear to be about the size of a small chicken, but with short legs and a short bill. 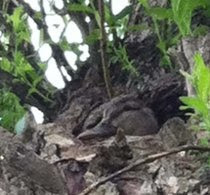 In several nests I saw two young and in others three. The nests were deep enough so there could be more inside. Some nests appeared to be unoccupied and others had an adult perched on the side of the nest as if standing guard over an incubating mate. 5/28 – Croton Point, HRM 34.5: There was a single ring-necked pheasant, first seen three weeks ago, still on the prowl at Croton Point. It is amazing how it has survived while carrying its own neon invitation to dine. June 14: 1:00 – 4:00 p.m. The Hudson River Before Henry: Hudson River Ecology after the Ice Age, presented by Tom Lake, NYSDEC Hudson River Estuary Program naturalist and archaeologist, at the Lake Luzerne Public Library [Saratoga County]. For information, email Cynthia LaBarge. The Lives and Legends of Hudson River Fishes, presented by Tom Lake, NYSDEC Hudson River Estuary Program naturalist, at the Saratoga Springs Public Library, 49 Henry Street, Saratoga Springs [Saratoga County]. For information, email Chris Alexander or Tom Lake. Copies of past issues of the Hudson River Almanac, Volumes II-VIII, are available for purchase from the publisher,Purple Mountain Press, (800) 325-2665.